You are currently browsing the The Pet Product Guru blog archives for the day Thursday, August 22nd, 2013. An easy way to tell if your dog is overweight is to feel his ribs. Use your hand to feel your dogs ribs. 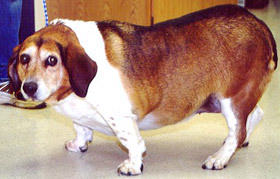 If your dog is overweight, it will be hard to feel the bone under his flesh. On the other hand, if your dog is too thin, his ribs will be sharp to the touch and easily visible. You may be able to see an indentation of a healthy dog’s ribs but your should not be able to count each one. The proper diet and plenty of exercise is essential to maintain a healthy weight. The following chart is provided by PetcareRX. Find you dog’s breed and check his weight.